Hedge Bindweed, the most common of the bindweeds that occur in Britain, is a notoriously difficult plant to eradicate from gardens. The roots of this plant travel great distances and are extremely fragile; but even a small piece of root will produce a new plant. Usually hairless, this climbing perennial plant can reach a height of well over 2m. 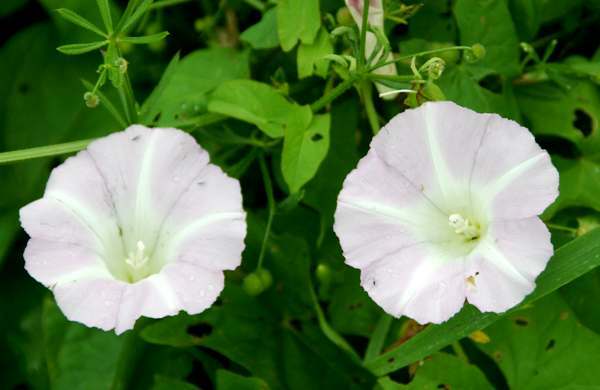 It has arrowhead-shaped alternate leaves, and white or occasionally pink flowers 3 to 6cm in diameter in the form of broadly trumpet-shaped with five fused white sepals backed by two large non-overlapping bracts nearly half the length of the sepals. The flowers have creamy white centres. 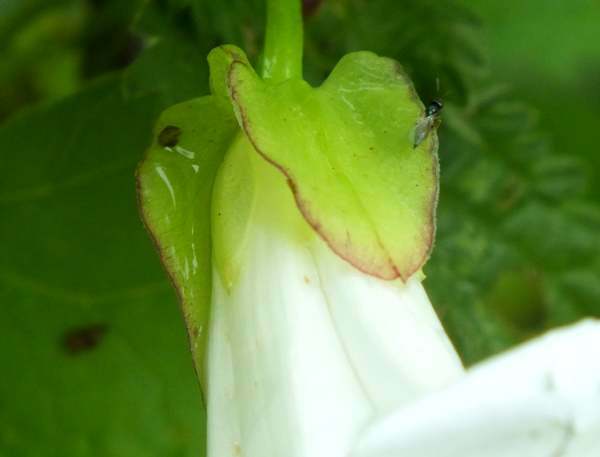 Common and widespread across most of Britain and Ireland, Hedge Bindweed Calystegia sepium is also found in temperate regions throughout the world. 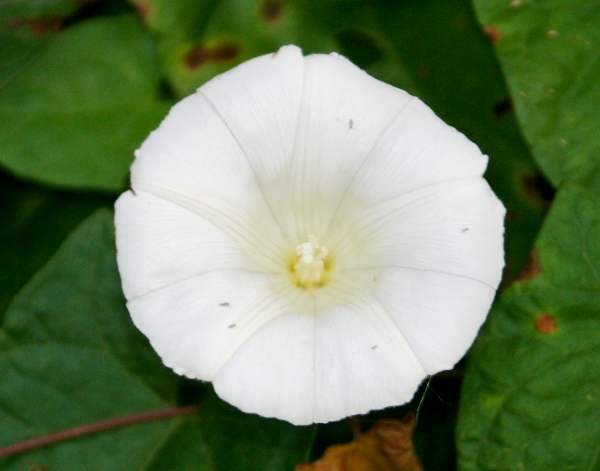 Hedge Bindweed grows, as its name suggests, on hedges; however, it is also a common sight along woodland edges and occasionally on scrubby wasteland. 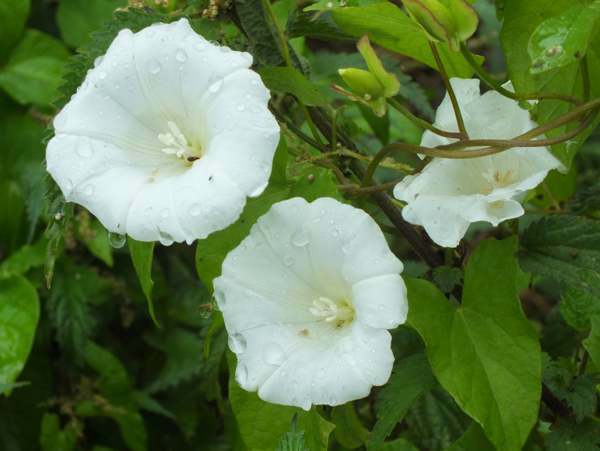 In Britain and Ireland, Hedge Bindweed usually produces flowers from June to September. 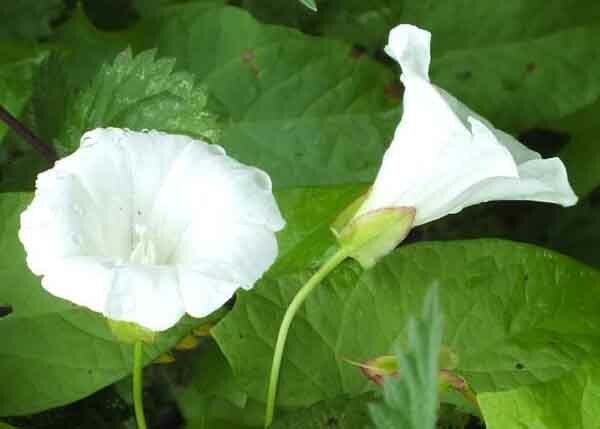 Large Bindweed Calystegia silvatica, a species introduced to Britain from the Mediterranean region, is very similar but can be distinguished by its two overlapping bracts, which are typically one third the length of the sepals. Field Bindweed Convolvulus arvensis has smaller flowers than Hedge Bindweed, and they are generally pink, with or without white stripes, but just occasionally they may be entirely white. Other far more colourful members of this family grow throughout Europe, and the Mediterranean region in particular. My favourite of these is Convolvulus tricolor. It is found on farmed land, and no doubt the farmers do not share my enthusiasm for it. All of the bindweeds are anti-clockwise twining climbers.